I just spent the past eight days in classrooms and sailing in the Solent and the English Channel preparing for an adventure of a lifetime. 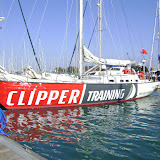 In March 2012, I will be taking part in an ocean race, the Clipper Round the World Yacht Race! I will be on the longest and toughest leg, sailing 6,000 miles across the Pacific Ocean from Qingdao, China to California. 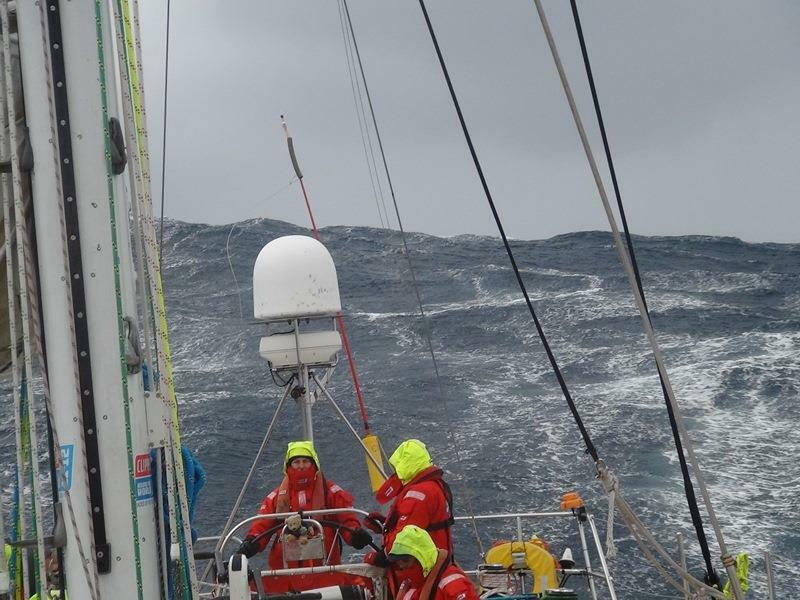 This is not a sail for the faint of heart as the Pacific storms are known for their intensity. In the last race, one of the racing yachts was dismasted in the Pacific Ocean when a rogue wave hit them broadside, flipping the boat 120 degrees before it self-righted. Our first day of Level 1, training was spent with a RYA (Royal Yacht Association) First Aid course, learning CPR, near-drownings, the effects of cold water shock, and other types of emergencies that could arise on a boat. In addition, we also practiced the recovery position both in the classroom and in the confines of one of the boats. That was quite difficult, as we had to maneuver the “casualty” in a narrow area. In the afternoon we were formally introduced to the boat that we would be spending the next six days on. 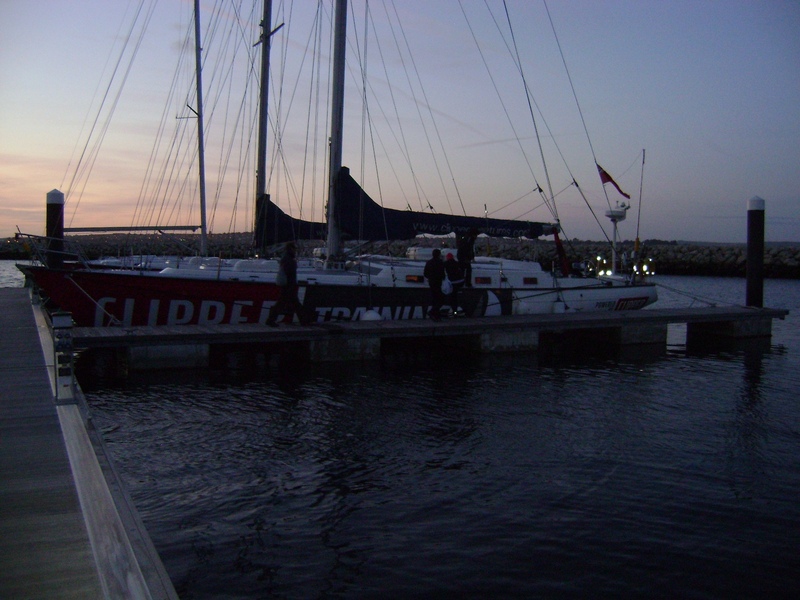 She was a Clipper 60 which had sailed around the world in the 04/05 race. Quite a bit different from my Hunter! 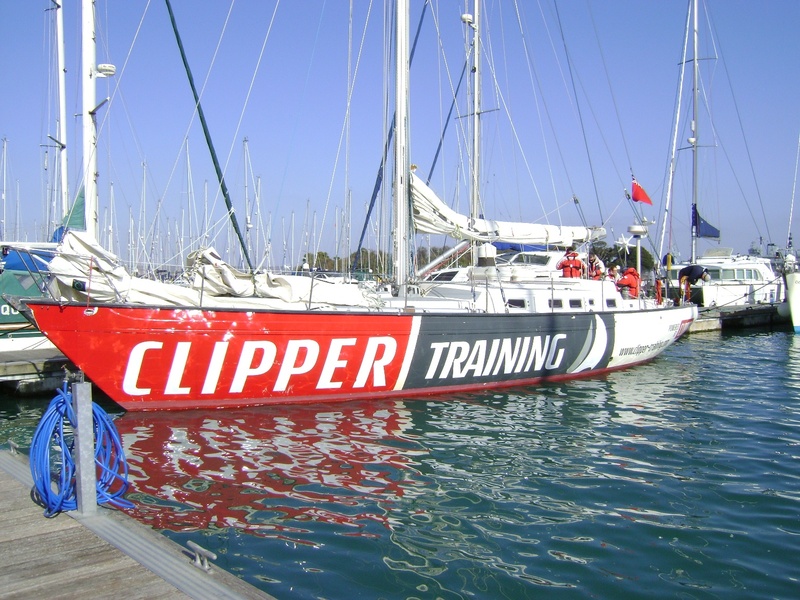 Whereas I have two sails (excluding my storm sails) that easily roll out and back in (roller furling), the Clipper boats have eleven which have to be man-handled up on deck from down below in the boat, attached and then raised. These boats are stripped-down ocean racing boats that accelerate and sail very quickly. We were also introduced to our accommodations, bunks that line the sides of the boats with lee clothes that are designed to stop a person from rolling out when the boat is heeling, or leaning – sometimes heavily – to one side. The Ritz Carlton it’s not! 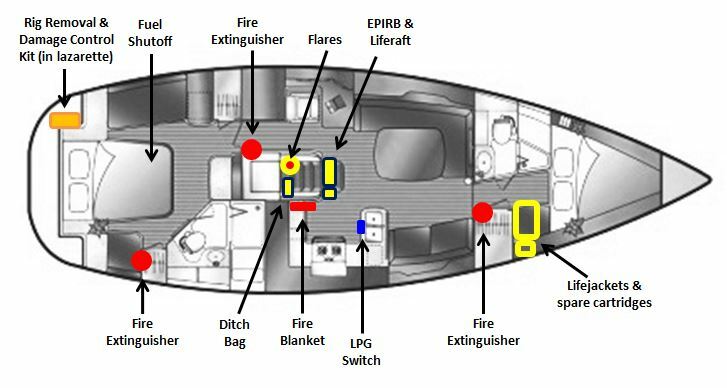 The boat also has two basic heads (toilets), a galley (kitchen) with a three burner stove and oven. However, there is no microwave or fridge, just two coolers in which our perishables were kept. All in all, it was a cozy boat for the 12 of us who would be living and sailing together for the next six days. The next couple of days were spent learning the terminology of the different parts of the boat along with all the different lines and sheets (ropes) that would be used to raise, lower and control the different sails (yankee, staysail and mainsail). 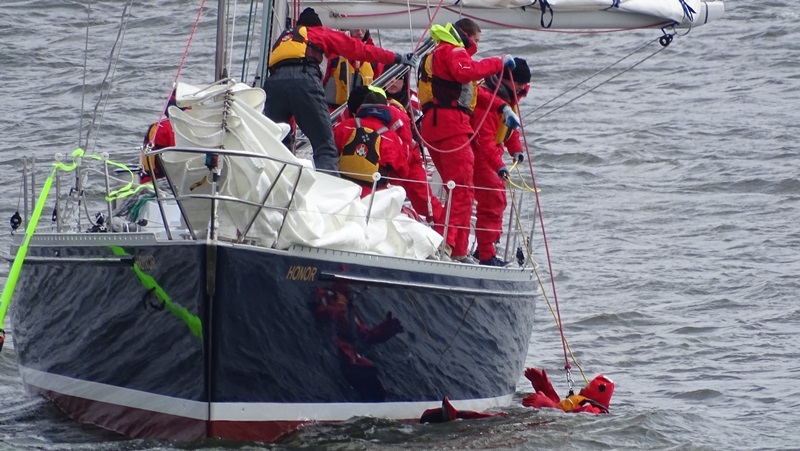 Along with learning the terminology, we also practiced as a team to raise and lower sails, tack, gybe and respond to man overboard drills. These went on repeatedly and by the end of just the first full day of sailing, I felt completely wiped out. By the end of the second day I was so physically exhausted, I had trouble keeping my eyes open as our skipper, Gordon, was briefing us. Then again, the jet lag didn’t help either. 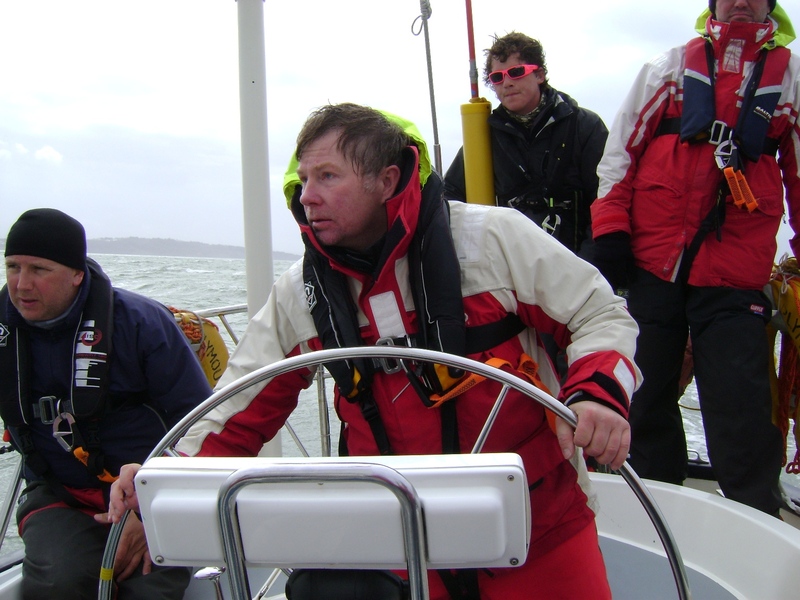 Our second day of sailing (third day of training) took us out into the Solent, past Ryde on the Isle of Wight (supposedly the inspiration for the Beatle’s song, Ticket to Ryde) and on to Cowles where we spent the night. As with most mornings, day four arrived early with breakfast being prepared by two members of the crew (we all took turns on ‘Mother Watch” cooking and cleaning for the rest of the crew). After breakfast, Gordon and Rich (the first mate) taught us how to rig the spinnaker guy and sheets and the spinnaker pole. That was interesting and fun, if a little confusing as it just introduced a bunch of new lines or ropes that we had to become familiar with! Nevertheless, we managed to rig it, after which most of us took turns climbing out to the end of the pole to see what that was like. 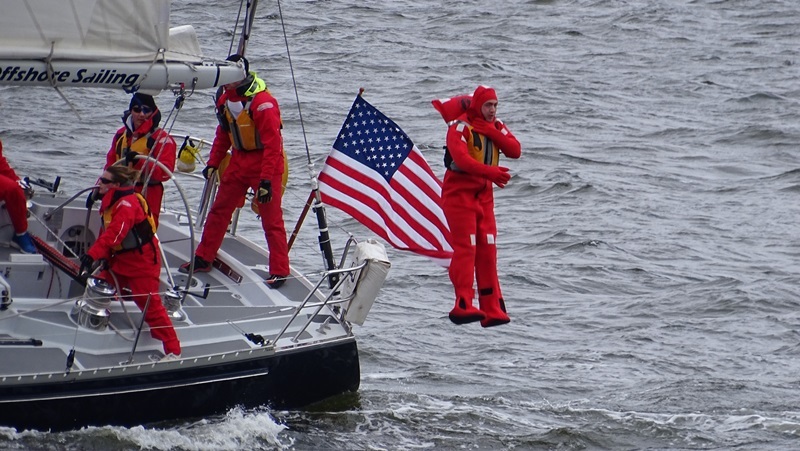 It was actually a lot of fun at the dock, however I could imagine it would be a different story if – or when – we have to do it in pitching seas and heavy winds! In the afternoon, we left Cowles and began our next trip – our first overnight sail – to Portland. 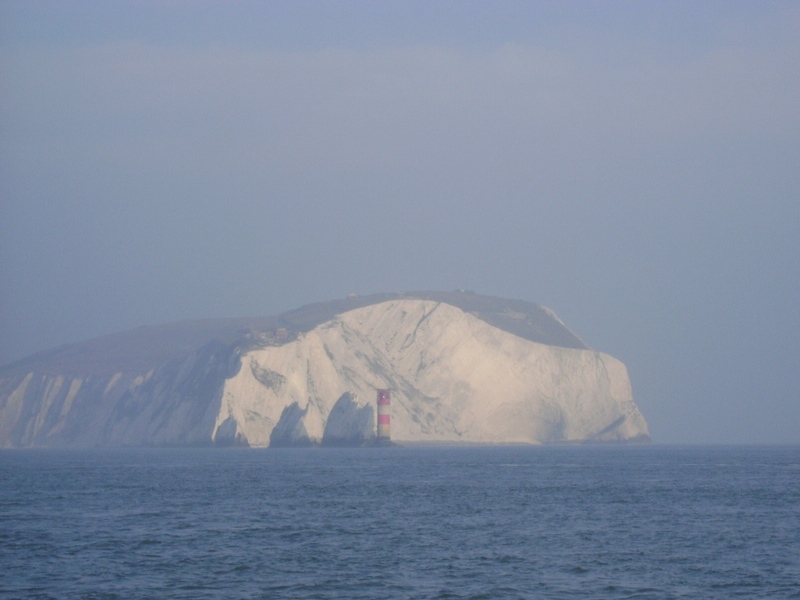 This trip took us out past the Needles (the western-most point of the Isle of Wight) and into the English Channel. As the crow flies, the distance from Cowes to Portland is only about 50 nautical miles, but we extended that during the night by sailing several times out into the English Channel close to the shipping lanes and back. Again, this trip was marked by countless tacks and gybes as we learned to work together as a team. Tiring as it was, it was a great feeling to execute a tack or a gybe smoothly and efficiently together as a well-oiled machine (perhaps aspiring machine with a few moments of stuttering). Each day we seemed to be getting better and better at working as a team on the different evolutions (raising, lowering and changing sails, as well as tacking and gybing). That has been one of the many highlights of the training. As we sailed into the night, we started with pleasant weather albeit cool, with the wind between 5-15 knots, seas smooth and temperature in the high 30s. 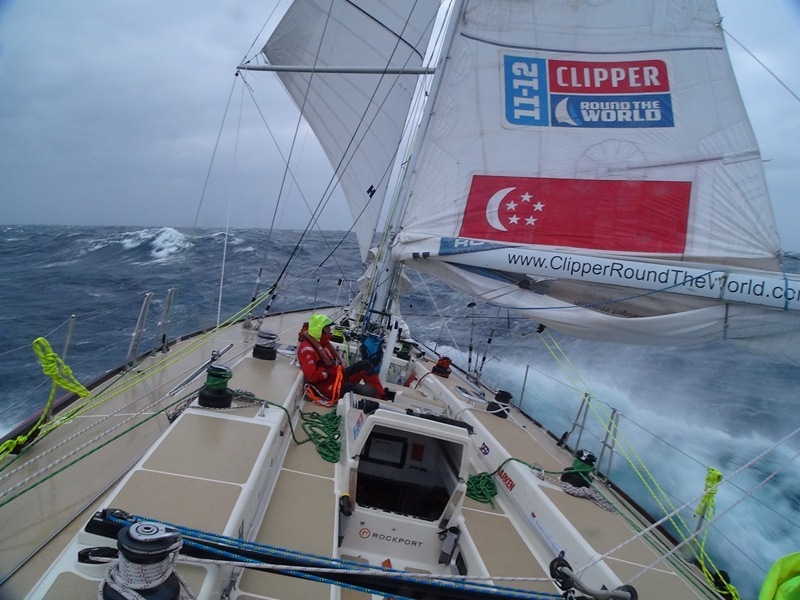 Our skipper had organized us into 3 hour watches and I was on the 9–12 am and 3–6 am watches. These are normally my favorite watches when I am sailing overnight. In the evening I enjoy watching the stars shining in the sky far from land without any city lights spoiling the view. The early morning watch is normally equally beautiful as the eastern horizon is slowly revealed with the barest glow long before the sun pokes its head above the horizon. Alas, this night it was not to be. Although the evening started out fine, the wind and seas did pick up a bit as the night wore on. We had wisely reefed earlier in the evening, so we were prepared for the rising winds. However, what many were not prepared for was the feeling of being down below with the boat rocking and bouncing in the increasing seas. 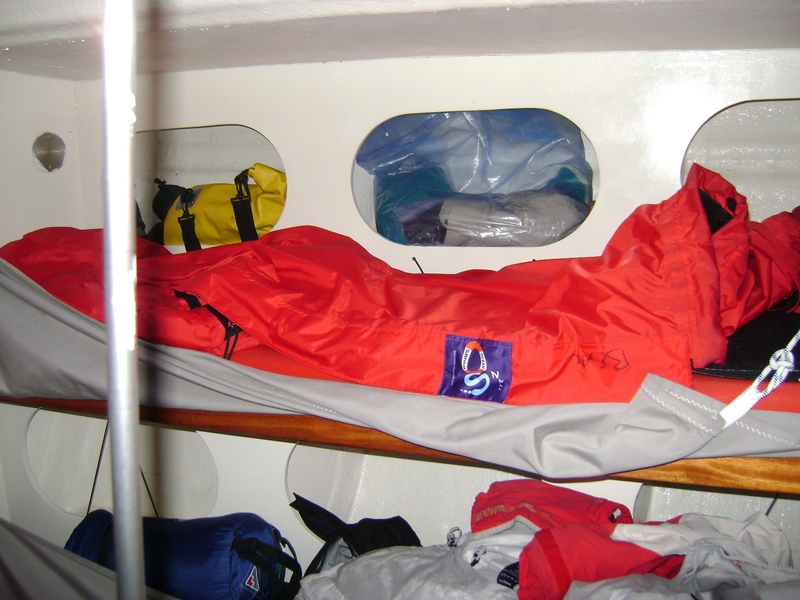 As it came time to end my first shift of the night, I decided that rather than sleeping on the top bunk all the way forward, it would be more comfortable to sleep on the sails on the floor. Even though it was a bit bumpy sleeping forward, it was comfortable. Unfortunately, the 2 ½ hours of sleep ended far too quickly. As I came onto the deck just before 3 am, I noticed that a vast majority of the crew were seasick and looking rather pale around the gills. There was no relief for many, even some who have spent a lot of time working on boats or have sailed along the coast of England. 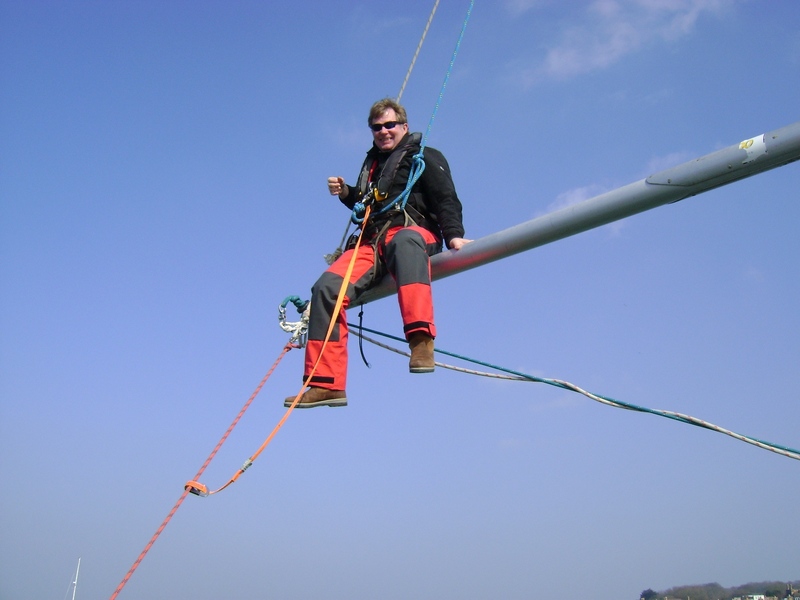 Interestingly, Jim, who had never stepped foot on a sailboat before this training, was one of the few who were fine! You can never tell sometimes who will be sick and who will be fine. And, for the record, I was not one of the crew that was seasick (others may dispute that). Although I was burping up some of my dinner, I did not feel nauseous at all (I ate much more than I should’ve but I was ravenous from all the hard sailing). However, when one of the other crew members on my early morning shift had to make a beeline to the stern (back of the boat), I decided that perhaps it may be a good idea as well and I headed for the lee side (downwind side) of the boat. A couple dry heaves later, I felt fine. And, no food lost (sorry for the details!). If that is what seasickness is like (again, which I dispute I was) then it is a piece of cake. Unfortunately, others were not so lucky. 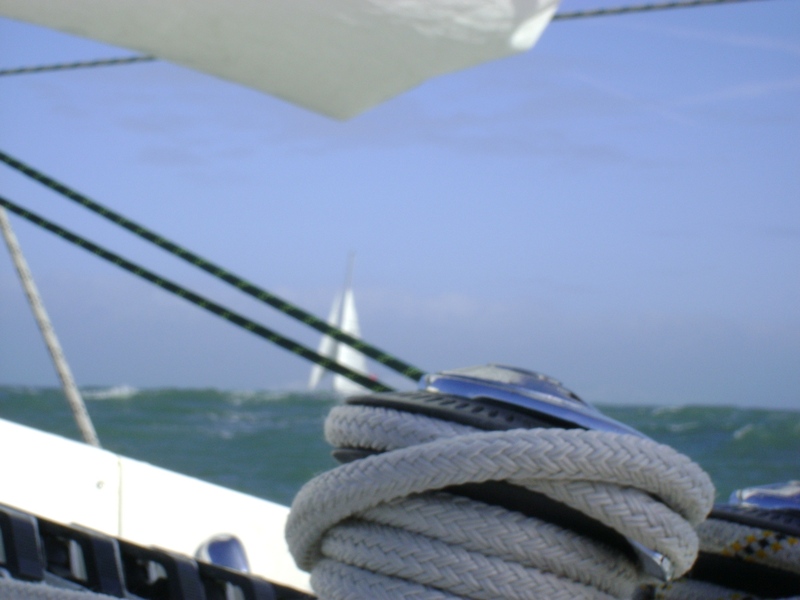 From what I hear, seasickness comes in two stages. In the first, you feel like you are going to die. In the second, you wish you had! I’ll keep my fingers crossed for the future. Cold and tired after a very wet and windy sail, 6 am was a welcome relief as I made my way down below and climbed into my sleeping bag. I woke up later that morning with the boat entering Portland Harbour, finally at our destination for the day. Day five in Portland started out with us doing our regular post-sail routine of tidying up and stowing the lines and sheets (ropes) down below as well as flaking and stowing the sails. After a good wash down of the boat, and a breakfast, it was on to practice an actual MOB (man-over-board) recovery on the dock. The exercise consisted of one of the crew members lying on the dock with his lifejacket inflated as if he was in the water. 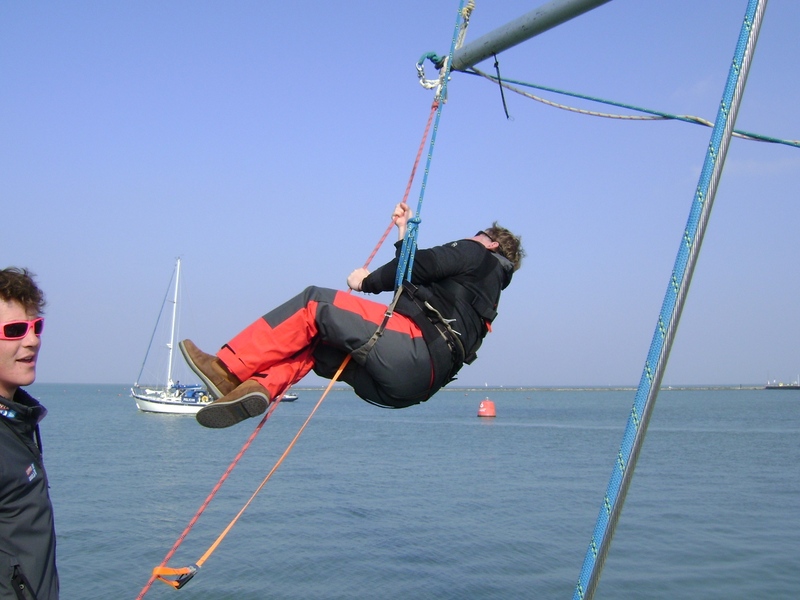 I donned the climbing harness, set up our rescue lines and was lowered over the side of the boat, walking down the hull until I reached the “casualty”. At that point, I had to put a lifting strop (MOB sling) around his body and under his arms. Next, I slipped another sling under his legs so we could lift him in a horizontal position (to prevent hydrostatic squeeze in a real situation). I found out, this was not very easy to do, even at the dock! Nevertheless, a very useful exercise and one you hope never to have to do in an actual situation. Portland, UK is an interesting town on the southern end of England. Besides being the venue for the 2012 Summer Olympics sailing events, it is also the home of Radio Caroline, which was one of the illegal radio broadcasting ships off the coast of England in the 1960s. It was also known as the Boat that Rocks and it (or others like it) was glorified in the fictitious movie, Pirate Radio with Philip Seymour Hoffman. Our sixth day of training got off to an early start with plans of leaving Portland by 7 am in order to reach the Needles when the tides were favorable. As soon as we were out in the harbour and raising the sails, we knew this would be an interesting trip. The winds were gale force eight (39-46 mph) out of the southwest which meant that we would have a mostly downwind run all the way back to Cowes. Sure enough, as soon as we were out of the harbour and in the Channel, the wind and waves made an exhilarating ride back. The sun also came out which made the day one of the best sailing days I’ve had in years. There’s nothing like surfing down a wave in a stripped-down ocean racing boat going 14 knots (16 mph)! All too soon, the sailing part of the training ended and it was on to a day of sea survival training. 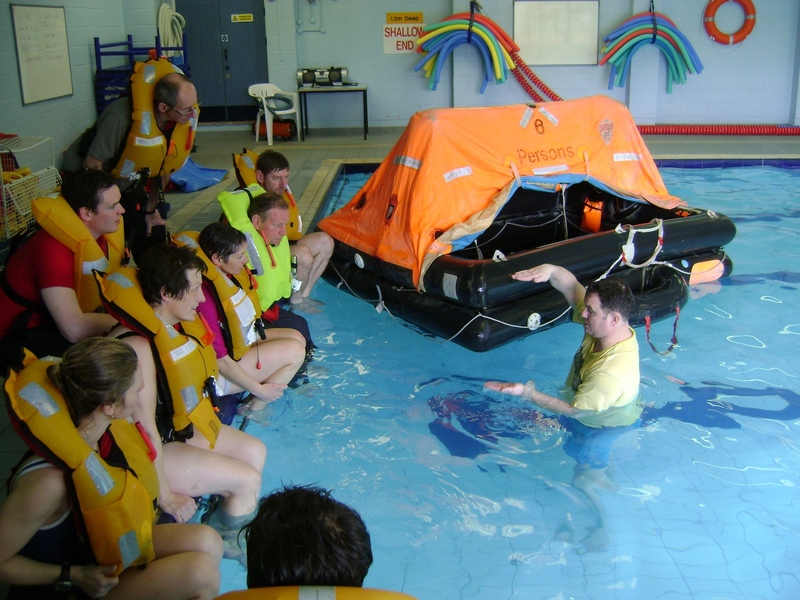 Although I had completed a sea survival course before in the U.S., it was nothing like the one that the RYA (Royal Yacht Association) offers. The morning was spent in a classroom listening to lectures and slideshows on many aspects of sea survival. 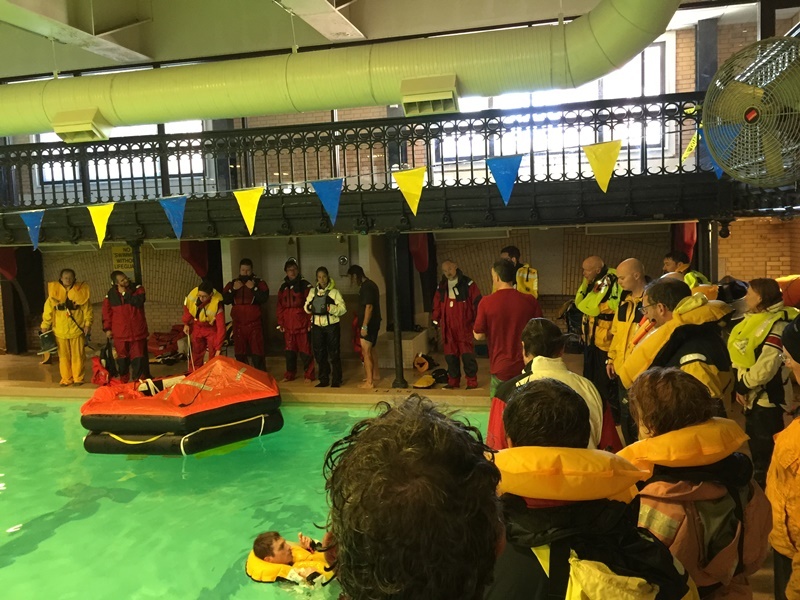 In the afternoon, it was on to the pool for several hours of learning how to swim with an inflated lifejacket (not as easy as it sounds), towing unconscious casualties, learning how to minimize heat loss in water and righting and climbing into life rafts. By the late afternoon, it was on to a hotel at Heathrow for an early flight home, tired and exhausted from a wonderful yet demanding week of world-class sailing and education. 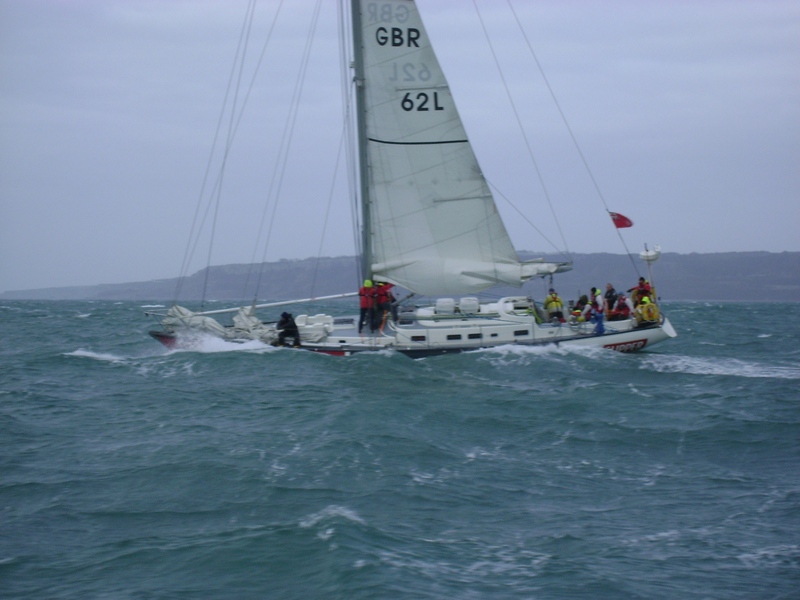 This entry was posted in Ocean Racing and tagged Clipper Round the World, ocean racing, sailing, sea survival, yachts on March 15, 2011 by Greg Kyle (ChefonaBoat).